I’m sure this will offend many of you, but I really don’t like your kids. I shouldn’t say that, I don’t really dislike other people’s kids. However, I secretly find kids that are not my own to be of a lesser pedigree than mine. They often seem less intelligent, whinier, and much less aesthetically pleasing than my children. Their poop smells worse, the pictures they draw are ludicrous and would cause me concern if my child had drawn them. The intentions of other peoples’ kids are often evil. This makes me sound horrible, but I suspect if everyone was to open up that locked-away vault of secret thoughts, we would find that I am not the only one who feels this way. I may just be the only who is willing to admit it. My kids are adorable and “really advanced for their age.” They practically parent themselves. Their artistic scribbles fall within the range of prodigy. When they do things wrong, it’s because they just don’t understand all the consequences of their actions yet, and they are so cute that I can hardly stand it. If my kid hits your kid, it’s because she doesn’t know that she’s hurting your kid—besides your kid probably provoked her. My child is normally kind and gentle. There is just no way that my darling child would ever purposely harm another human being. But if your kid hits my kid, your kid is a monster who needs medication and counseling, and they are obviously the victim of horrible parenting skills. Fortunately, we all fake it quite well. 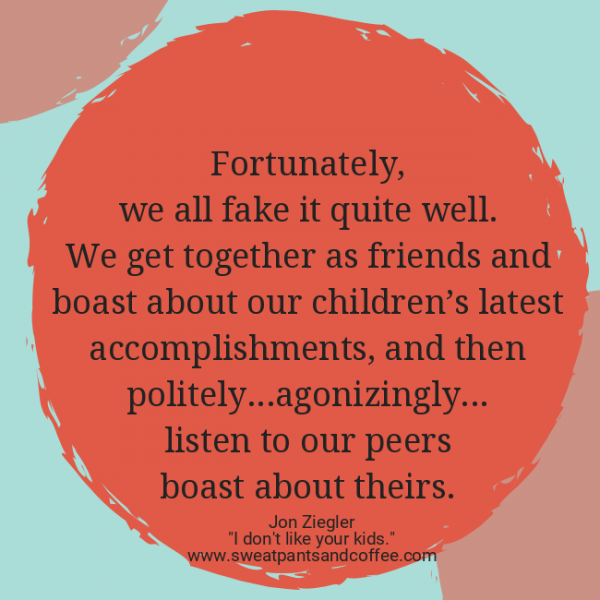 We get together as friends and boast about our children’s latest accomplishments, and then politely…agonizingly…listen to our peers boast about theirs. I don’t think there is a parent out there that doesn’t think their child is either a genius, an artist, or an NFL sure-thing. Me? 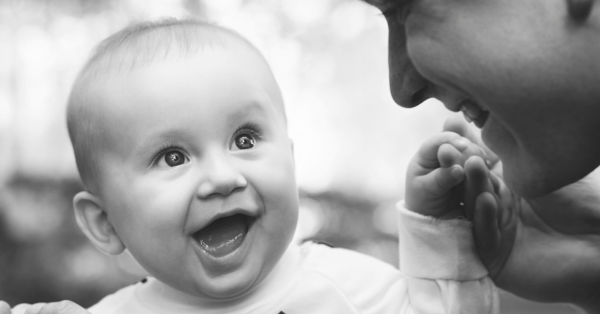 I don’t have to boast about my child. I’m sure it’s quite obvious she is Mensa material. The loudspeaker would most certainly end every friendship between the parents of children in short order. We are lucky enough to maintain these friendships even without the loudspeaker. Furthermore, if there is a dispute between our children that boils down to the conflicting testimony of one child against the other, my child is obviously telling the truth and your child is obviously lying. After all, I know my kids, and they would never lie to me. My kids are to-the-point, and they speak their minds. Your kid is rude and disrespectful. My kids are cute when they mess up words and phrases. Your kid sounds like a blithering idiot. When my kid spills their milk on the table, I say “Ooopsie” and smile. When your kid spills his milk on the table, it affirms that he is a clumsy oaf. I suppose that a lot of this type of thinking might be a symptom of our own insecurities as parents, and maybe we are just used to the smell of our own kid’s poop and not the smell of other kids’. It’s not like I hate other kids. I try hard to see my friends’ children in the same light as my own, but the fact remains, that they just aren’t my kids. So, please don’t be offended when I say that your children are of a lesser quality than my own. It’s truly nothing personal. And be assured that I understand if you don’t have all that much affection for my kids, even if you are polite enough to not say so.